Citizenship and Immigration Canada (CIC) is asking Canadians for their input to decide on the country’s level of immigration and the mix of immigration programs used in selecting new Canadians. Currently the federal government has a target of admitting between 240,000 and 265,000 immigrants in 2013. While many argue this is too many, and placing pressure on Canadian workers, some provincial governments are calling for higher levels of immigration to meet their provinces’ growing demand for labour amid ageing population. Determining the best ‘mix’ of the different types of immigrants admitted will require evaluating the values that Canadians want the country’s immigration program to represent. Currently 40 percent of immigrants come through family class and refugee / humanitarian class programs, while 60 percent come through economic class programs, which include the Federal Skilled Worker Program (FSWP) and Federal Immigrant Investor Program (FIIP). The family and refugee class programs are meant to meet Canada’s commitment to the values of generosity and humanitarianism, while economic class programs are administered to benefit the country economically through their focus on admitting only the most skilled and qualified immigrants. Stakeholders invited to provide input include employers, labour, academia, learning institutions, professional organizations, business organizations, regulatory bodies, municipalities, Aboriginal groups, settlement provider organizations and ethnocultural organizations. The online consultations are open from June 21 to August 31, 2013, and are taking feedback here. 2. MAKE MANDATORY TO EVERY ONE TO GIVE CITIZENSHIP TEST,NO EXEMPTION FOR 54 AND OVER AGE. 4. IF P.R. HOLDER STAY OUT OF CANADA MORE THAN 180 DAYS LOSE STATUS OF P.R. 5. CANCEL DUAL CITIZENSHIP OF CANADIAN CITIZEN. 6. IF ANCESTORS CAME TO CANADA FROM ANY OTHER COUNTRY IN THE WORLD, LOSES CITIZENSHIP IMMEDIATELY AND FACES DEPORTATION. Focus on the people already here on temporary visas- internationals students and temporary workers, in particular. 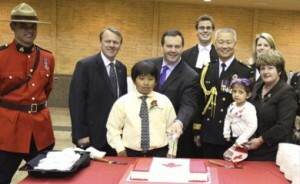 Make it easier for them to become Canadians (PRs, that is) and they can then bring in their spouses and kids. The biggest problem many newcomers face is their lack of Canadian Experience (real or percieved). Why not make it easier for those who have already got it? It’s a no brainer!